Feburary 2015 – Concurrent Technologies has introduced a new 6U CompactPCI® board based on a 4th generation Intel® Core™ or Celeron™ processor with the option of 10 Gigabit Ethernet interfaces. 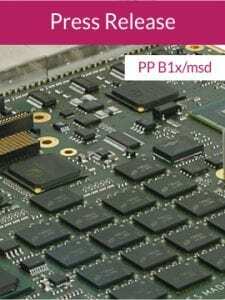 PP B1x/msd is a single slot air-cooled board, allowing customers to easily migrate to the latest generation of Intel®processors for longer system life-cycles. Three levels of performance are offered from a 4-core Intel® Core™ i7-4700EQ, 2-core Intel® Core™ i5-4422E to a 2-core Intel® Celeron™ 2002E processor with options for 16 or 32 Gbytes memory. All PP B1x/msd variants are capable of driving three simultaneous displays with DisplayPort, DVI-D and VGA port options available and powered by the integrated Intel® HD Graphics processor. New to this generation of CompactPCI boards, Concurrent Technologies has introduced an option for dual 10 Gigabit Ethernet interfaces via front panel SFP+ modules supporting 10GBASE-SR, 10GBASE-CR and 10GBASE-CU connections. This option allows for higher bandwidth interconnects between PP B1x/msd and external equipment which would previously have required the use of an additional expansion mezzanine like the Concurrent Technologies XM 520/032 module. Also new to PP B1x/msd is the option to specify a variant with the J4 connector fitted to add a mix of extra I/O including digital graphics, more USB, Ethernet and GPIO. This complements the Ethernet, SATA, USB and Serial I/O provided on the CompactPCI J3 and J5 connectors that is backwards compatible with Concurrent Technologies’ PP 91x/x1x. Other notable features include up to two XMC/PMC sites with high speed local bus interconnect, on-board 2.5-inch SATA drive and on-board CFast™ removable storage. “This new PP B1x/msd CompactPCI board provides a performance upgrade for customers using PP 91x/x1x that will enable them to continue to deploy innovative solutions. The new features on PP B1x/msd are a direct response to feedback received from our customers demonstrating our commitment to this popular form factor”.